Steve Brown (aka, Shaggy Rolling Stone) was raised in Marietta, Georgia, in the sunny south, and he’s been a music lover and collector his entire life. His younger years included traveling around the country, bouncing between Grateful Dead Tours and Rainbow Gatherings, and exploring new places as often as he could. He crisscrossed the country dozens of times, selling art and food and picking up extra jobs ranging from blueberry picking in Maine to construction work in the Virgin Islands. His journeys later expanded to Thailand, Korea, Jamaica, India, and Denmark. Everywhere Shaggy traveled, he paid close attention to the local music. In 1992, Shaggy came to Eugene, and connected with a number of local community establishments, including the Oregon Country Fair, Growers Market, and Saturday Market. He also co-founded Kindtree Productions/Autism Rocks, and produced multiple non-profit concert events. He soon discovered the local public radio stations and became a huge fan of KRVM. In the late ‘90s, Shaggy began sitting in with Mike Meyers on the Friday Free for All, learning what it takes to host a show on KRVM. 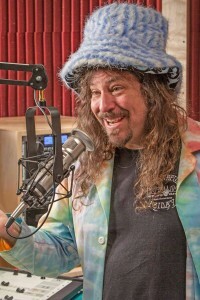 Later for KRVM, he created and hosted a show called Tribal 120 (now, Sounds Global) and began hosting Celtic Quilt. Currently, Shaggy co-hosts Live Archive, and also fills in for several of KRVM DJs, covering different types of shows and genres and expanding his musical horizons. Shaggy works at a number of jobs and is the father of two beautiful boys and an adult daughter. They spend a lot of time with Shaggy and have been coming to the KRVM studios since they were infants, often helping Shaggy host his shows. Last year, Shaggy’s eldest son produced and hosted his first segment on In the Spotlight.